"If he makes a f****** complaint it's going to be a f****** media firestorm"
The video also shows an officer standing on his ankle while he was cuffed on the ground. Three officers have been disciplined. 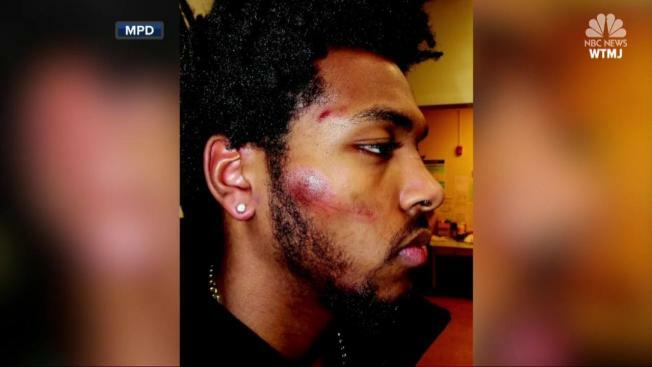 Police joked and talked about being perceived as racist after using a stun gun to arrest Milwaukee Bucks guard Sterling Brown, newly released video shows. The body camera and squad car videos, obtained by WISN-TV and posted online Sunday, reveals police joking about the arrest and discussing how, if Brown made a complaint, people might say they were racist. Milwaukee police officers swarmed Brown in January when he didn't immediately take his hands out of his pockets as ordered. Brown had been standing and talking with a group of officers as he waited for a citation for illegally parking on a disabled spot outside a Walgreens. He was tasered and a police officer stood on his ankle while he was handcuffed, the new video shows. Afterwards, as Brown is taken to hospital, the cops are caught on video talking about the potential repercussions of their actions. Officer 1: "We're trying to protect ourselves?" Officer 2: "I'll give you the Bucks player." Officer 1: "Because he play's for the Bucks, if he makes a [expletive] complaint it's going to be a [expletive] media firestorm." Officer 1: "And then any little [expletive] thing that goes wrong is going to be, 'Ohhh the Milwaukee Police Department is all racist, blah, blah, blah.'" Later on the officers are heard talking about how they could be perceived as racist for arresting a black Bucks player, with one saying if anything goes wrong, it "is going to be, 'Ooh, the Milwaukee Police Department is all racist, blah, blah, blah.'"